It's 20 minutes away from here. Then, I can get a good night's sleep. 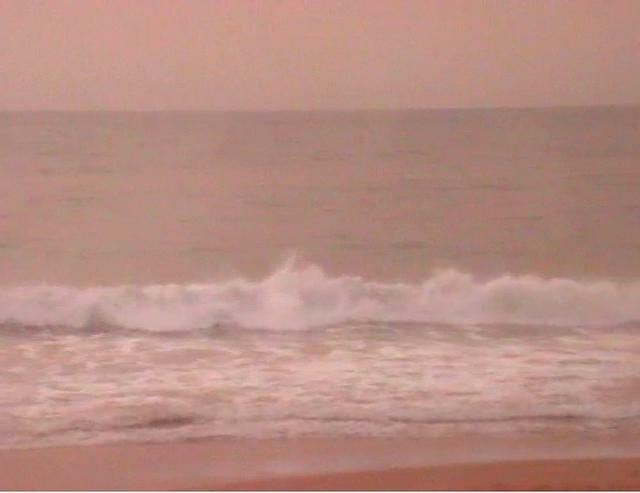 Wow, 33 and windy and dusty here at 5 pm yesterday to 12 at 5.30 this morning with heavy drizzle love it. I thought it was a typical overcast post-Southerly day, in spite of the forecast of "Sunny", but what we have is a mixture of cloud and dust. The dust would be aloft, above the Southerly air stream. Even though the sun rose 40 minutes ago, it has yet to make its presence felt. 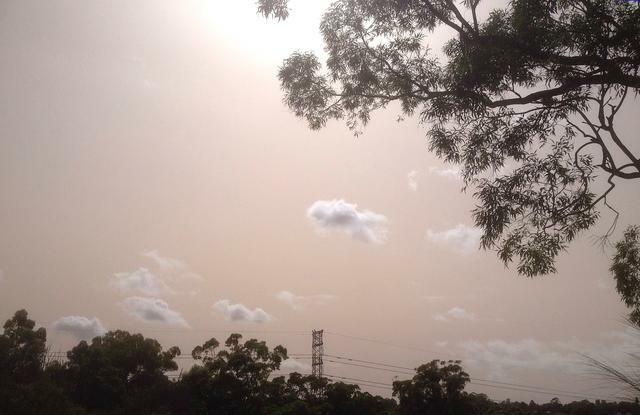 Dust extends between Ulladulla and Grafton. From Coastwatch.com, contrast auto-enhanced, saturation increased slightly. Maybe like Mars when it still had Oceans. Plummeted down to 1.7° C this morn'...bloody well done! Today's forecast for a maximum of 14° C at Rhine Falls (1,205 m AMSL). Maybe BOM should actually look out the window before it finalises it’s forecast. Any frost with that min? Some morning dust haze clearing to a mostly sunny afternoon. Winds south to southwesterly 25 to 35 km/h turning southeasterly 15 to 25 km/h in the early afternoon. Not sure if can see a dust storm around here, certainly not like that spring 2009 dust storm that left red dust everywhere, but conditions are similar. Nice drop in temp though, after the brutal heat this week. It was fairly dusty at 2am this morning before the change moved in, stars were all very faint apart from the brightest stars. The sky has a very Mars look atm. Red above and blue on the horizon with a few indistinct, odd coloured clouds. What a country of contrasts floods to the North of the Country in the Gulf of Carpenteria. Without a doubt there will be some countries that would be enveloped in that area of inundation. 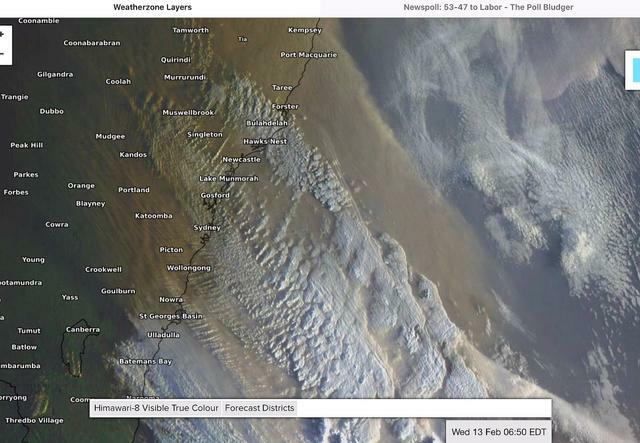 Also the Dust plumes are huge as well, making their way well into the Tasman Sea. 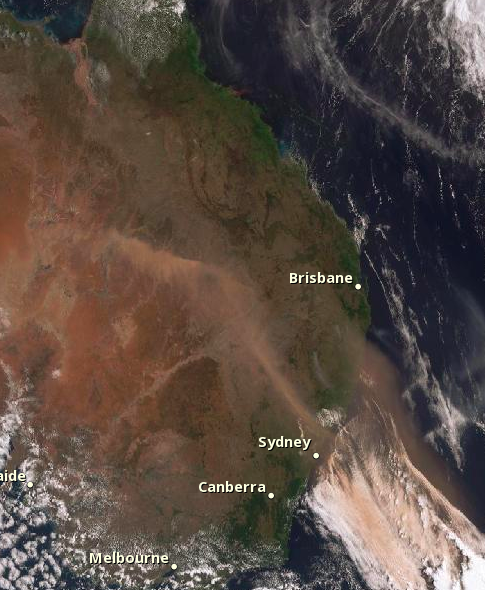 This shows us that even though areas of the Tablelands and East Coast have got decent rainfall areas out west are still struggling, quite evident with so much dust being lifted. Biggest summer dust storm I've seen! Unfortunately my PWS software is wunderground which works form midnight to midnight not the 24hrs to 9am. Aye, some light frost. Nothing to write home about. Skies at Shellharbour are now mostly blue, after Yellow this morning. We had a sprinkle of rain last night, just enough to leave all the local cars speckled in dust bunnies. It's much clearer in Sydney too although the sky is still not quite the right colour. It's still dusty to the East. Here's the view nearby around 10:20 AM. It's sunny and about 25 at OH, having reached 26.7 earlier. Penrith at 29.4 is just short of its forecast maximum of 30. Dust has completely cleared here now. Nice and sunny.